He’s one of the most outspoken and respected voices in the business world, and you can meet him live in-person at The Financial Brand Forum this April. Gary Vaynerchuk has been called a lot of things. Serial entrepreneur. Internet philosopher. Marketing mastermind. Social media genius. One thing is for certain. The 43-year old has an intensity that’s as undeniable as it is palpable, as he serves up a unique cocktail of marketing insights that can be compelling, funny, and inspirational — usually all at the same time. Vaynerchuk is a case study in capitalism, an incredible story of success and self-determination that starts — somewhat ironically — in communist-controlled Russia. He was born in Belarus in 1975, but his family emigrated from the USSR to America when he was three. Eventually the Vaynerchuks settled in Edison, New Jersey. Shortly thereafter, his father launched the family business — Shoppers Discount Liquors — in nearby Springfield. After college, Vaynerchuk moved back home to work for his father at the family’s liquor store, which was an unexceptional enterprise in nearly every way. However, this “blank canvas” would serve Vaynerchuk nicely as lab where he could put his grand experiment to the test: harnessing the power of the internet to build a brand. “I know exactly when I found out about the internet,” he recalls in an interview with Fortune magazine. It was 1994 and he was a freshman in college. “I was like, ‘Wait a minute, we don’t need 8,000 liquor stores. We can just build this,” he says referring to the WineLibrary.com website that he eventually built. 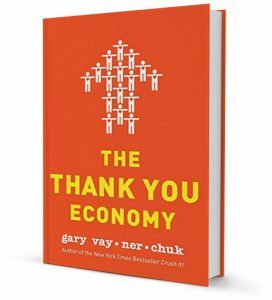 According to Vaynerchuk, his father gave Gary an ad budget and “enormous freedom.” Then, at the age of 23, Vaynerchuk assumed total control of the business. He took full advantage of the autonomy his father granted him, as well as new digital marketing tools that few people at the time were thinking about. He started with email first, then social media and Google AdWords. About a year after YouTube was founded, Vaynerchuk started making wine-tasting videos that quickly amassed hundreds of thousands of views. Meet Gary Vaynerchuk live in person! Don’t miss Gary Vaynerchuk’s opening keynote at The Financial Brand Forum — April 15-17, 2019. Turns out Vaynerchuk has a gift for marketing, a skill he attributes — at least partially — to his upbringing. “My dad doesn’t talk. He literally doesn’t talk. The human does not speak,” Vaynerchuk joked in an interview with Entrepeneur. “I’ve had to spend my entire life trying to extract from him what he was thinking and feeling.” According to Vaynerchuck, this turned out to be a valuable skill, because marketing, by its very nature, requires the same sort of intuition. Five years after taking the reins, Vaynerchuk’s digital marketing acumen had transformed his dad’s sleepy $3 million “booze barn” and turned it into an online wine business with over $60 million in revenues — also one of the first e-commerce retailers in the world. Skip ahead. Today his business VaynerMedia is a digital media powerhouse bringing in over $200 million in sales annually. The firm has 800 employees serving major corporate clients including Chase, Johnson & Johnson, PepsiCo, Toyota and Anheuser-Busch. Vaynerchuk is tireless — a huge believer in the value of hard work, usually putting in 16-hour days. He is also a content marketing machine, pumping out an unbelievable stream of video, audio, and blog material every day. With a legion of over 12 million online fans — many of whom are obsessed with him — he is a living, breathing example of the power of brand-building in digital channels. His success and insights have become mythologized — an undeniable and well-deserved chapter in the history of digital marketing. Vaynerchuk has also been an early investor in numerous successful digital companies like Uber, Venmo, Twitter, Facebook, Snapchat and Birchbox. A guy with this kind of track record who makes as many good bets as Vaynerchuk has is definitely someone worth listening to. Which is precisely why The Financial Brand booked Gary Vaynerchuk as the opening keynote speaker at the Forum 2019. Don’t miss it. Register today. Don't miss the biggest and best event in banking! Gary Vaynerchuk joins an all-star lineup at The Financial Brand Forum including Barbara Corcoran, Abigail Posner, head of strategy at Google, and over 70 other speakers. 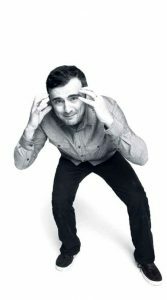 Gary Vaynerchuk has authored no fewer than six books, including Jab, Jab, Jab Right Hook: How to Tell Your Story in a Noisy World, The Thank You Economy, and Crush It! — all NY Times best-sellers. 1. Your marketing mindset must be digital-first. “Television, outdoor, and direct mail are not dead, they’re just overpriced,” Vaynerchuk says. “Snapchat, Instagram, and Facebook are the NBC, ABC, and CBS of our day.” But financial marketers are out of touch and behind the times with outdated strategies. 2. Great content is the lifeblood of modern marketing. “No matter what you do, your job is to tell a good story,” Vaynerchuk points out. 3. Jab, jab, jab… right hook. 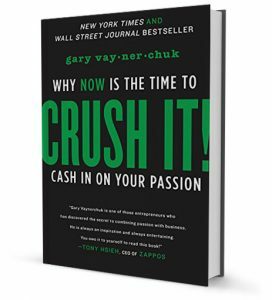 This is the title of one of Vaynerchuk’s many thought-provoking books, and the concept is to soften up your audience before you hit them with a sales message. 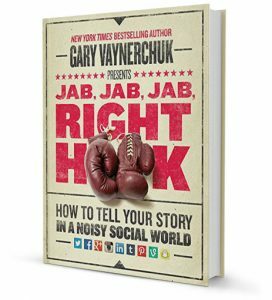 Vaynerchuk says your approach to marketing should be to hammer people with a series of jabs in the form of entertaining or educational content before you land that right hook and hit them up with a call-to-action. Give people something of value as a gesture of goodwill first, then get people to purchase your product. In other words, give, give, give, and then sell. 4. People’s attention is the most valuable currency in the world today. 5. Master the art of social media. 6. Creating value and delivering great CX are the same thing. “You need to spend all of your time and energy on creating something that actually brings value to the people you’re asking for money,” says Vaynerchuk. That means simplifying people’s lives and addressing their pain points. Few industries are more averse to change than banking. But Vaynerchuck prides himself on being a disruptive innovator who’s always experimenting with new content and social media platforms. He wants you to think about all the ways you could destroy your business. The lesson here is have a proactive approach, because defensive and reactive strategies are a recipe for obsolescence — from taxi companies to Blockbuster and Borders. 8. Navel gazing leads to imitation, not innovation. 9. Build a culture that inspires greatness. 10. Transparency, passion and purpose are key. The Financial Brand Forum 2019 kicks off April 15th!